1. To marinate, make 3 or 4 diagonal cuts on both sides of the fish. Rub inside and out with the salt and wine, and put the ginger in its belly; set aside for 20 minutes. 2. Discard the ginger from the fish; pat dry. Rub the cornflour into the cuts. Heat 2 tbsp groundnut oil in a wok over a high heat and sprinkle with a little salt to prevent sticking. Fry the fish for 3-4 minutes, turning once, until golden. Set aside. 3. Discard the oil and wipe the wok clean. Add the remaining oil and, over a medium heat, stir-fry the chilli bean sauce until the oil is red and fragrant, then stir in the ginger, garlic, onions, pepper and chilli, if using. Stir-fry for 2-3 minutes. 4. Pour in the stock and bring to the boil. Add the wine and sugar, then slide the fish into the wok. Simmer for 6-7 minutes, spooning the sauce over the fish and turning it once, until the fish is cooked and the sauce is syrupy. 5. Ease the fish onto a serving dish. 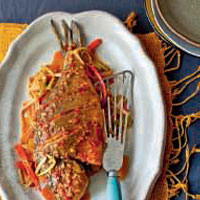 Stir the sesame oil into the sauce and pour over the fish, then serve.